The Minerva Obelisk is 17.9 feet tall (41.6 feet with base) and has four lines of hieroglyphics. It was originally erected at Sais by Pharoah Apries during the period of 589-570 BC. It was brought to Rome by emperor Diocletian (284-305 AD) for the Temple of Isis, a lost temple near the obelisk's current location. It fell over at some point, was buried by the rubble of the ages, and was found in 1655 (many sources say 1665) in a garden belonging to a Dominican monestary. 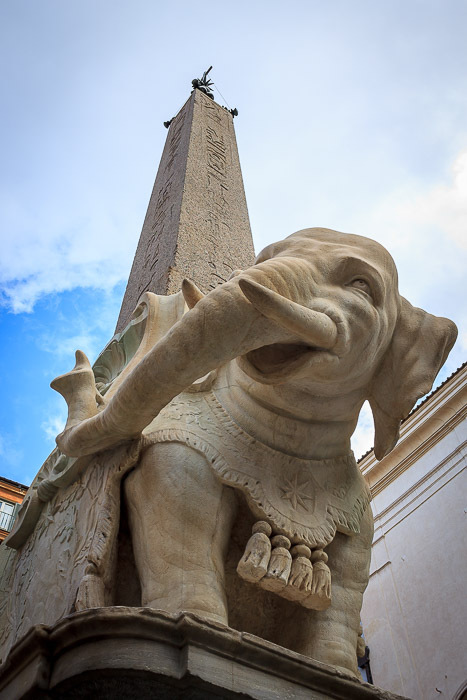 In 1667 it was erected by Pope Alexander VII on the back of the adorable little Elephant base created by Gian Lorenzo Bernini. The obelisk is named the Minerva Obelisk because the place it now stands was once a temple to Minerva. See all Minerva Obelisk photos. 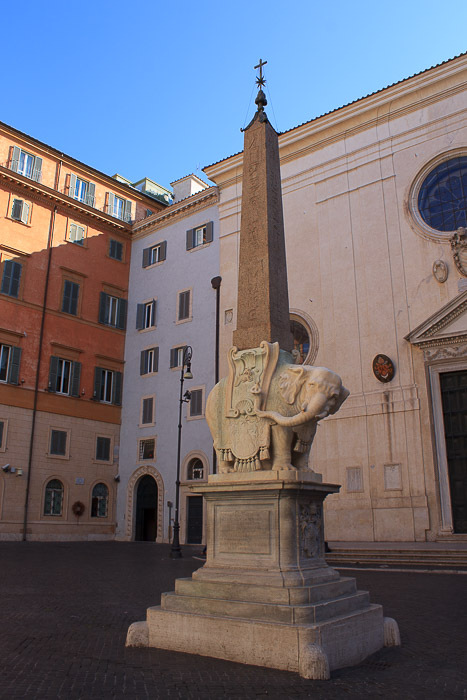 An interesting story about the elephant tells that Bernini wanted the elephant to have the normal four legs with nothing between them, with the obelisk's weight being carried by the elephant's legs. But Father Paglia was envious of Bernini receiving the commission and convinced the Pope that the legs alone would not carry the obelisk's weight. 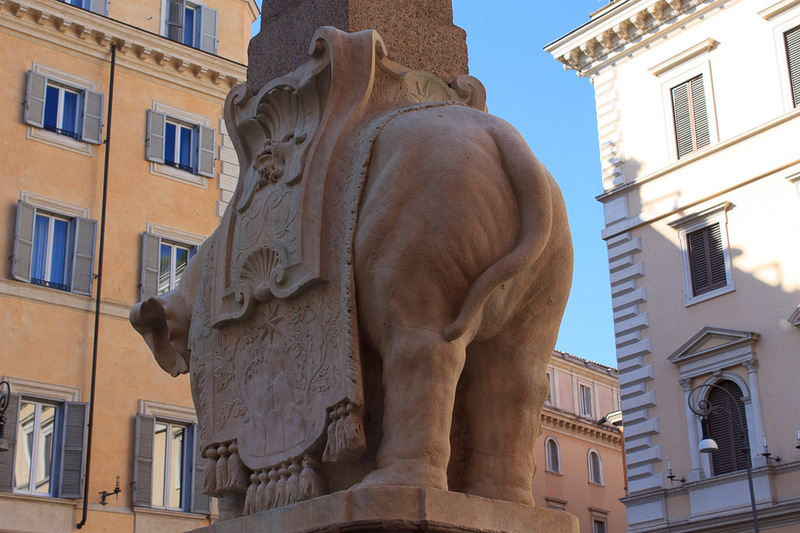 So Bernini, although he disagreed with the design, had to add a block between the elephant's legs and Bernini was not quite successful in disguising the heavy look of the cube by adding a saddle to the elephant. 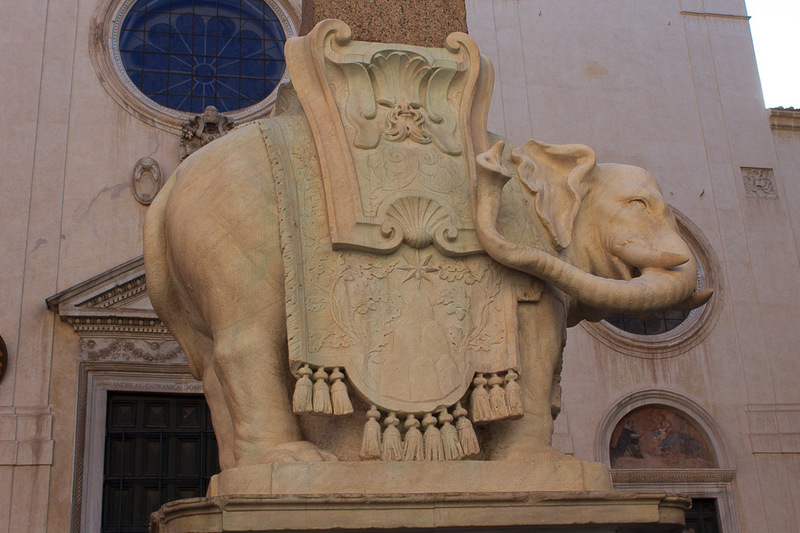 He was so upset by the forced modifications that Bernini sculpted the elephant such that his rear end pointed toward the Dominican monestary, and with the tail slightly shifted toward the left, in the attitude of saluting Father Paglia and the other Dominican Friars in a rather obscene way (2nd photo below).